BOSTON — HapYak today announced HapYak Interactive Video has been selected as a finalist in the Most Strategic Use of Data Driving Audience Targeting or Personalization category for the 22nd Annual MITX Awards. Held annually by the Massachusetts Innovation & Technology Exchange, the awards showcase the latest innovative technology and work shaping the future of customer experience. A group of over 80 esteemed senior leaders have selected finalists across 26 different categories. Finalists competed in the first round of judging and were assessed on their submission’s value proposition, unique innovation, execution, and results. The 2018 categories in this year’s program showcased an abundance of innovation, creativity, and impactful results. HapYak is being recognized for the HapYak Interactive Video Studio, which delivers everything needed to control branding, placement and timing of overlays, and user experiences. Interactive elements can be added to one video or thousands, using templates across the video library, in addition to broad publishing capabilities, like custom landing pages and support for dozens of popular video players. 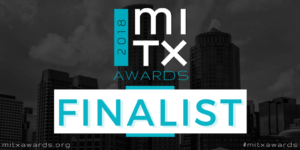 HapYak will be recognized with the other finalists in the category of Most Strategic Use of Data Driving Audience Targeting or Personalization at the 22nd Annual MITX Awards Ceremony traditionally attended by hundreds of the region’s top tech and innovation professionals. Winners will be announced at the ceremony on May 24th at Royale Boston. This year’s ceremony will include host, James P. Connelly, dinner and drinks, networking, and of course, the presentation of the prestigious MITX Awards. Tickets can be purchased at www.mitxawards.org. At MITX, we’re building valuable connections between the people and ideas behind technology and its impact on the future of customer experience, all to create a community that’s finding tomorrow’s solutions together. Celebrating 22 years of connecting tech and innovation professionals in New England, MITX is a dynamic community of more than 20,000 thought leaders and collaborators. MITX is headquartered in Boston, MA. For more information, visit http://www.mitx.org/.